Note that software listed here is already scheduled to be installed, it is not necessary to submit requests for software, unless updating to a new version. Please note that fully completed forms are required for any change to the labs, even for free software. All software installation media and licenses are also required by the due date. Requests for the Spring 2018 semester should be submitted by November 10, 2017. Requests submitted after the deadline may not be installed in the labs for the Spring 2018 semester. This is because we need time to develop an installation procedure and test the software in the lab environment before deploying the software. We also require a number of weeks to deploy the lab images across campus, which means our solutions need to be complete and tested several weeks prior to classes beginning. Please submit your Software Request forms ASAP. Using “Video Mute” aka “Video Blank” stops the projector display without powering down the whole system. Need to work on the PC privately? Or do you want to switch between the whiteboard and the projector but not wait for cool down and warm up times? From a Crestron podium select VIDEO MUTE to stop the projector from displaying. From a White Hall podium select VID BLNK to stop the projector display. In an unrenovated classroom press BLANK on the remote to stop the projector display. UPDATE: The generator test in Horan Hall has been completed. Physical Plant will be conducting a generator test in Horan Hall Monday, October 23rd at approximately 10am. There will be two brief outages, one while switching to generator power, the other while switching back to main power. This will not affect the rest of campus. Check your schedule. 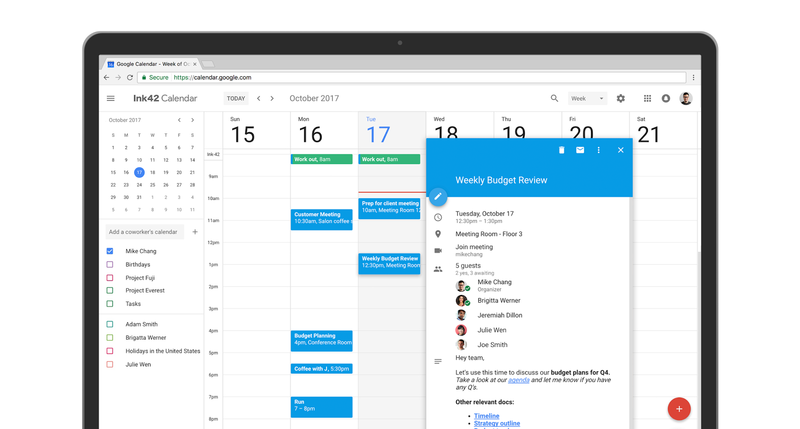 Starting today, a fresh look and new features are coming to Google Calendar on the web to help you manage your time more efficiently and get more done. We’re taking a lot of what you know and love from Calendar’s mobile application, like the modern color palette and sleek design, and bringing it to the web with a responsive layout that auto-adjusts to your screen size. We’ve also added more features for enterprises to help teams schedule and prepare for meetings. Add rich formatting and hyperlinks to your Calendar invites. Link to relevant spreadsheets, documents or presentations in your Calendar invite and open them directly from the new “Event Detail” view. This can help you create more detailed agendas and ensure all materials are in one place before your meeting starts. Manage multiple calendars side by side in “Day” view. Now you can view and manage calendars in separate columns. 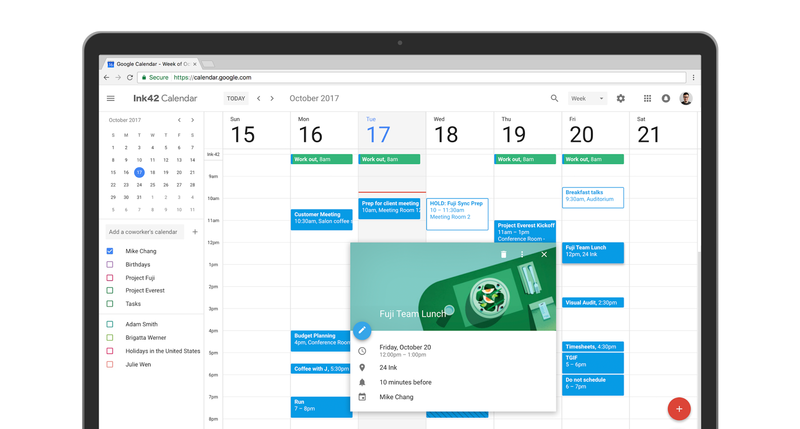 This makes it easier for employees who manage multiple calendars, like administrative assistants, to schedule meetings on behalf of their teams. Click “Day” view and select the calendars you want to compare. There are a number of other changes in Calendar, too. Now you can see contact information of meeting participants when you hover over their names in a Calendar invite. There’s also a new way to view and restore deleted items in one place in case you accidentally delete a meeting invite. Additionally, "Day,” "Week,” and "Month" views are now more accessible, featuring better compatibility with screen readers. For more detail on changes, check out this post. Google Drive Just Got Easier For You and Your Team! We’re pleased to announce Drive File Stream, a new application for your Mac or PC. 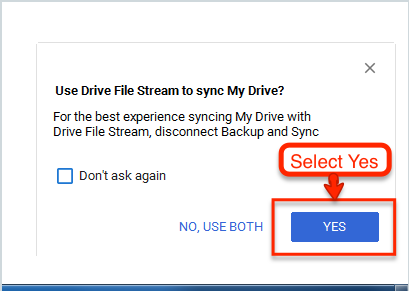 Use Drive File Stream to access all your Google Drive files from your computer while using less disk space and decreasing sync time. ITS has found the issue and fixed the Moodle log-in problem. We will be monitoring the server to confirm that it has been completely resolved. We are currently dealing with a log in issue to the Moodle Production server. We are troubleshooting and working to solve the problem. We will post an update when we have more information. Google Drive Sync will no longer be supported starting on December 11, 2017, and it will shut down completely on March 12, 2018. You may start seeing messages when you log in notifying of the upcoming changes. It is acceptable to take no action at this point. Client Services will have more information distributed soon regarding the best procedure to follow to handle this change with Drive. Google Drive will be replaced by Drive File Stream, a new application for your Mac or PC. Use Drive File Stream to access all your Google Drive files from your computer while using less disk space and decreasing sync time. More detailed information to follow soon. Take the Global Handwashing Quiz to determine how much you know about hygiene and handwashing. Cybercriminals use phishing—a type of social engineering—to manipulate people into doing what they want. Social engineering is at the heart of all phishing attacks, especially those conducted via e-mail. Technology makes phishing easy. Setting up and operating a phishing attack is fast, inexpensive, and low risk: any cybercriminal with an e-mail address can launch one. Limit what you share online. The less you share about yourself, the smaller the target you are for a phishing attack. Cybercriminals use information you post online to learn how to gain your trust. Beware of attachments. E-mail attachments are the most common vector for malicious software. When you get a message with an attachment, delete it—unless you are expecting it and are absolutely certain it is legitimate. Confirm identities. Phishing messages can look official. Cybercriminals steal organization and company identities, including logos and URLs that are close to the links they're trying to imitate. There's nothing to stop them from impersonating schools, financial institutions, retailers, and a wide range of other service providers. Trust your instincts. If you get a suspicious message that claims to be from an agency or service provider, use your browser to manually locate the organization online and contact them via their website, e-mail, or telephone number. Check the sender. Check the sender's e-mail address. Any correspondence from an organization should come from an organizational e-mail address. A notice from your college or university is unlikely to come from YourIThelpdesk@yahoo.com. Take your time. If a message states that you must act immediately or lose access, do not comply. Phishing attempts frequently threaten a loss of service unless you do something. Cybercriminals want you to react without thinking; an urgent call to action makes you more likely to cooperate. Don't click links in suspicious messages. If you don't trust the e-mail (or text message), don't trust the links in it either. Beware of links that are hidden by URL shorteners or text like "Click Here." They may link to a phishing site or a form designed to steal your username and password. You can either add these when you submit your space request, or you can go back to the event record and add the Resource. One of the most important steps in requesting services for your event when your first submit your space request. If you are creating the request, ‘Resources’ is the screen after you select the location. Update: License server maintenance was complete as of 10:35 PM on Friday, October 6th, 2017. Abaqus Research, Matlab, Maple, and Comsol were all tested and are currently working. The maintenance is expected to be done by 12:00 AM on Saturday, October 7th. 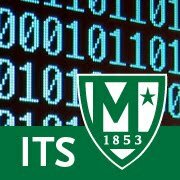 The maintenance will effect all users that are on the Manhattan College network and that use the software that have been listed above. We apologize for any inconvenience that this may cause. If you have any questions, please contact ITS at its@manhattan.edu or at extension x-7973. All of Client Services and Operations offices will be extremely short staffed between the hours of 10am to 2:30pm during the Fall 2017 Semester. This is due to the block scheduling of classes going forward, and is out of ITS' control. The timeframe for each staff shortage will change each semester due to schedule changes made by scholastic department chairs. All other requests will be processed in the order of which they were received. In addition, we will have a surge of staff members after 2:30pm, to address immediate issues as they arise. Please be mindful this policy is being put into place so that we can better support the Manhattan College community.